Before our first visit to Istanbul, it was hard to imagine how this historic Silk Road city straddles two continents – Europe and Asia. Its dividing line is the 17-mile long Bosphorus Strait, the narrow channel of water that connects the Black Sea to the north, with the Sea of Marmara to the south. 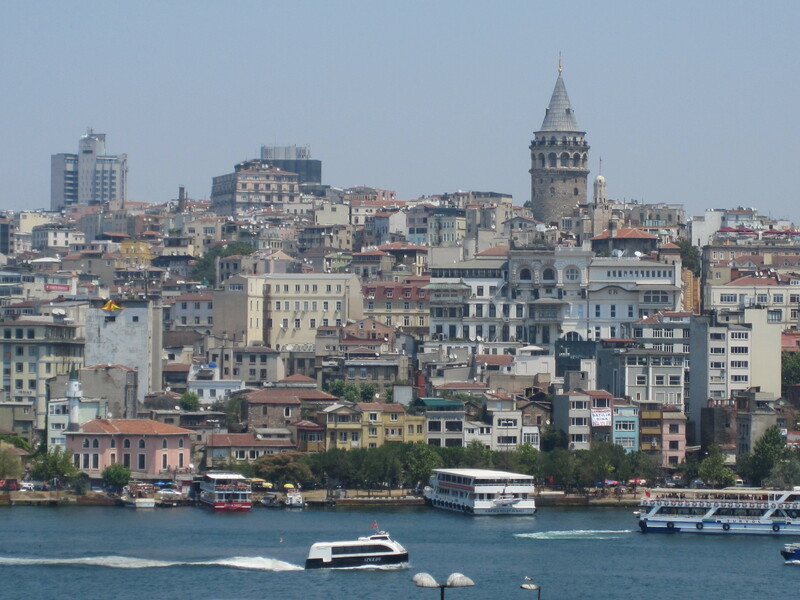 Although no longer the capital, Istanbul is Turkey’s largest and most memorable city. Ancient religious places of worship and palaces mix with modern European-style buildings and hotels. This blending of old and new makes this ancient city unique – it’s no wonder it has been used as the dramatic setting of many Hollywood films. With only a few days at the conclusion of our Regent Cruise, we confined most of our sightseeing to central Istanbul, which can be divided into four distinct areas: Seraglio Point (home to Topkapi Palace), Sultanahmet (dominated by Haghia Sophia and the Blue Mosque), the Bazaar Quarter, and the trendy Beyoglu district. It is easy to walk or take a taxi between locations, but try to have your destination written down and ready to hand to the taxi driver to avoid any confusion. Topkapi Palace, originally built as a residence for Sultan Mehmet, and then serving as a seat of government is now a museum. Allow several hours to explore its many courtyards, apartments, and pavilions. A must see is the Treasury room with its vast array of jewel-encrusted artifacts including the Topkapi dagger. Rent the award-winning 1964 film, “Topkapi” to see the Hollywood version. Across from the palace is the Blue Mosque, which takes its name from the 20,000 blue-green Iznik tile-work interior. No expense was spared in designing one of the most famous religious buildings in the world. The dome and six minarets of this 17th century masterpiece can be seen for miles. Not far from the mosque is the Haghia Sophia. This Byzantium Church is over 1,400 years old but is well preserved thanks to recent renovations. In the 15th century, the Ottomans converted this architectural wonder into a mosque. In 1936 it became a museum, and now many of the intricate mosaics and frescoes have been restored to their original grandeur. And, for a bit of trivia, in the movie “Argo,” you can watch actor Ben Affleck have a clandestine meeting in the Haghia Sophia. The Turkish people, known worldwide for their hospitality, are extremely welcoming especially to children. No shop could be entered without accepting generous offers of apple tea and biscuits, which my boys happily obliged. One of our favorite stores, Iznik Classics, offers the hand-made, color-rich tiles and ceramics Turkey is famous for. After a day or two of touring, a shopping trip to a bazaar provides a welcome change of pace. The Grand Bazaar with its labyrinth of streets is filled with over 4,000 booth-like shops. It is impossible to walk even a few steps without being summoned to sample all the exotic wares contained inside: intricate gold jewelry, embroidered silk scarves, antique copperware, and Turkish rugs. We spent hours wandering, bargaining, and getting lost. My son reminded me that actor Daniel Craig furiously drove a motorcycle across the roof of the Bazaar in “Skyfall,” the most recent James Bond flick. The Spice Market, although smaller, is worthy of close inspection. Known by its Turkish name, the Egyptian Market, it is filled with fragrant spices from the Orient and endless displays of dried herbs, tea, honey, nuts, and caviar. We filled several satchels with all sorts of delicacies to enjoy upon our return to the states. 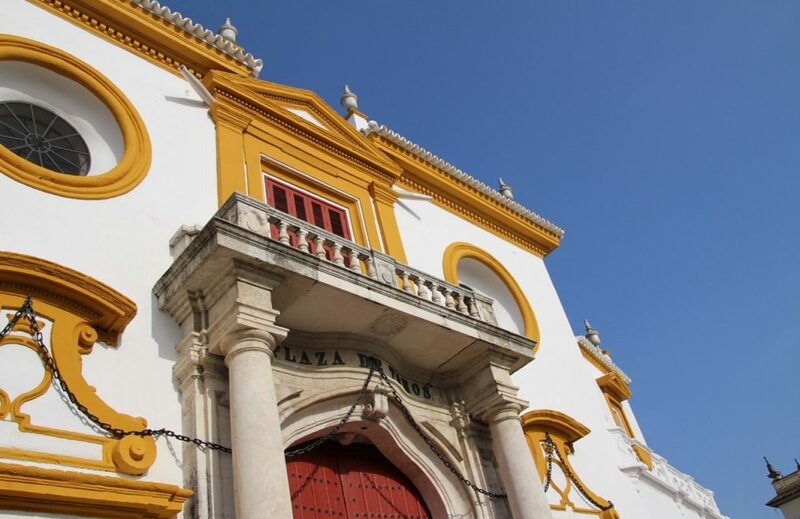 Next to the Spice Market is one of our favorite restaurants Hamdi. Perched several flights up it offers majestic views of the Galata Bridge, the Bosphorus, and the Golden Horn, the inlet that forms Istanbul’s natural harbor. After a long morning of walking, my kids dove into plates of meze (appetizers), lamb kebab, humus with pide bread (similar to pita), numerous cups of traditional Turkish tea, and ample plates of sweet baklava for dessert. 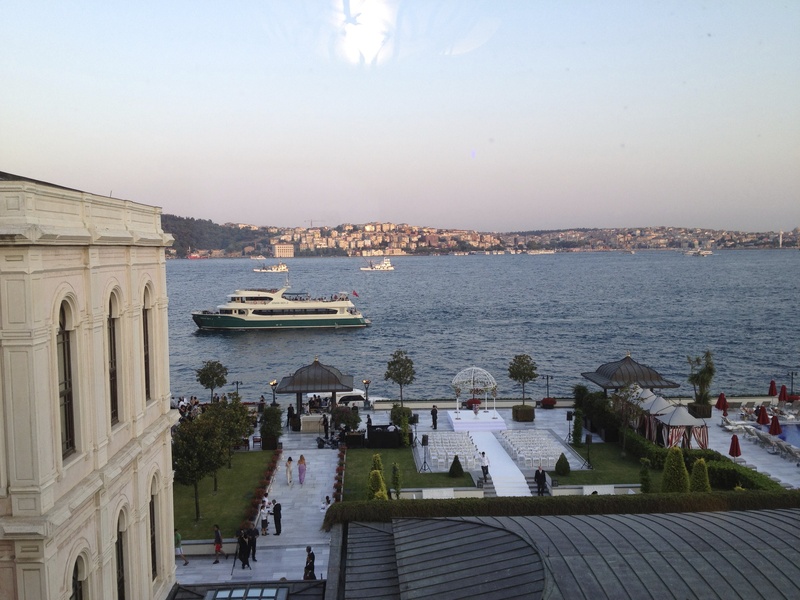 At the end of the day, we went back to our hotel, the Four Seasons—perfectly perched on the shores of the Bosphorus. Originally a 19th-century Ottoman palace, it was transformed into an elegant property that perfectly blends traditional and modern decor. 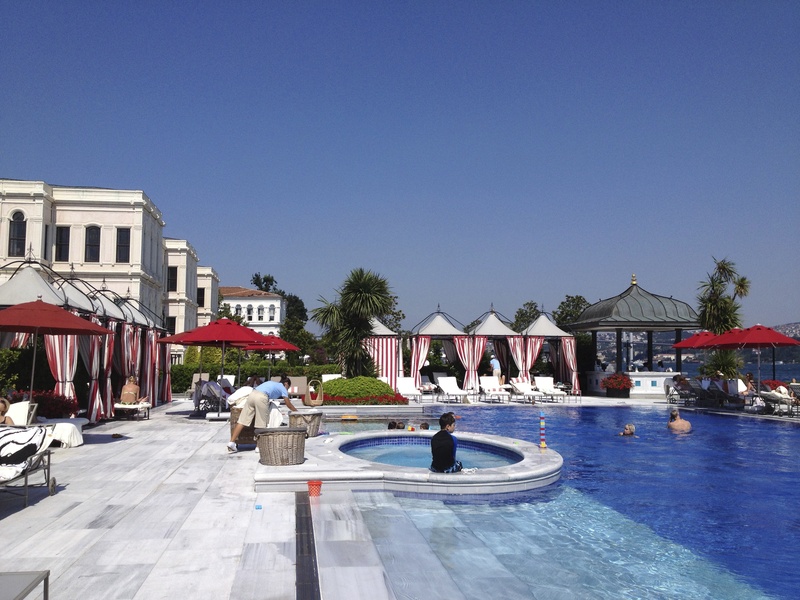 The boys cooled off in the marble-rimmed pool and heated up in the hot tub. We spent our evenings on the terrace at Aqua, the hotel’s romantic Mediterranean restaurant, feasting on plates of homemade spaghetti and langoustines. The Bosphorus Bridge provided us with our own movie-set backdrop as we watched the ferries make their way under this architectural wonder, beautifully illuminated by an impressive LED rainbow light show. 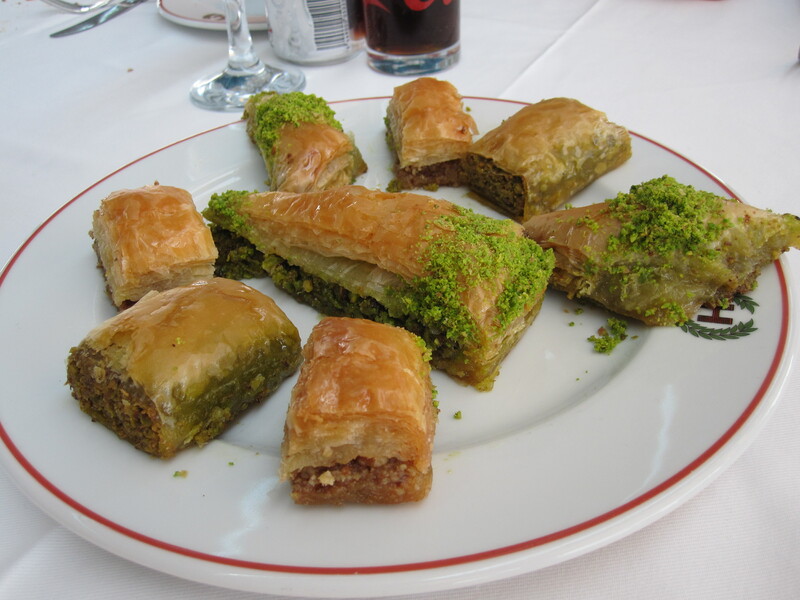 At home, we often reminisce about Istanbul’s exotic sights, tastes and smells. And, when we make our Turkish tea and sip it from our glass, tulip-shaped Spice Market teacups, we think often of returning to this distinctive city that connects the continents. Interested in visiting Istanbul by ship? Check out Regent Cruise Lines — their small, luxury ships specialize in unique ports and top notch service. 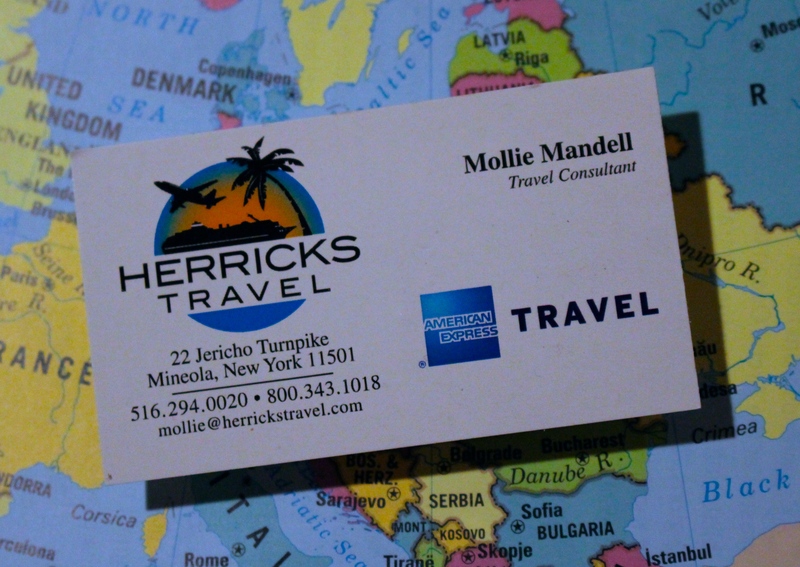 EMAIL SUBSCRIBERS: to view my previous posts, and my ENTIRE blog, please click here: uniquefamilytraveler.com . To become a SUBSCRIBER of unique family traveler, please enter your email address in the box on the upper right hand side of the blog (or scroll ALL the way to the bottom), and then make sure to respond to the follow-up email (check spam). Thank you! This entry was posted in Cruises, Istanbul, Turkey and tagged four seasons bosphorus, grand bazaar, istanbul, topkapki palace, turkey. Bookmark the permalink. Thanks for reading, and have a great trip — sure to be a memorable adventure! What a great city. I have fond memories of it from back in the late 80’s and up until a few years ago still had the leather jacket I bought while in the bazaar. The leather in the leather jacket remains a question mark but all the same I got a lot of use, and stories, out of it. Thanks for your comments! You are right, the bazaar is very memorable — a feast for all of the senses. Hope you get to return soon. You took me back, I have been to Istanbul since the late 80’s … I will be planning a group adventure trip (cycling, hiking, scuba diving and coastal driving) next year … thanks for the fond memories. I’d like to host you in Istanbul next time you visit. I organise and lead walking tours in lesser known neighbourhoods.